Before you jump into the process of cleaning your pond, consider the possibility of hiring a professional. As a Master Certified Aquascape Contractor, Domina's Agway offers pond maintenance and cleaning services. Whether you clean your pond or hire a professional is really a matter of personal preference. Now if you decide to have it done by a professional that you know and trust, you have the confidence to know it's going to be done right, taking little or no time away from your day. Plus, if a professional happens to be washing out the filter media and finds a problem, they can address it right there. 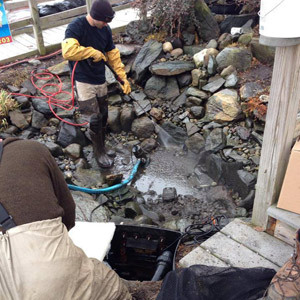 The trained eye of our Pond Guys could even prevent a problem before it occurs. So, will you go for the personal satisfaction of cleaning out your pond or will you trade your hip boots in for the TV remote and let the Pond Guys at Domina's Agway do the work for you? The choice is yours. Need a hand with your Pond Cleanout? Call 401-683-1203 or fill out your info below. You'll hear from us within 24 hrs.